The Camino Primitivo arrived just when we needed it. After weeks of walking we finally moved back into the peace and quiet of what felt, for us, like a pilgrimage. If there were two bookends to this journey, then they would have to be the first half of the Chemin St. Jacques (the Aubrac plateau and its environs) and the Camino Primitivo. Both of these parts of our pilgrimage were “off road” if you will. That means they were more remote, quieter, very scenic, little road walking, and more physically challenging. All those elements combine to yield a more contemplative atmosphere with fewer distractions. It was a great relief to finally get underway from Oviedo. It is a nice city, but Robin and I were hungry for the backcountry, and the Primitivo delivered. I guess my only complaint would be that it is too short. I would have loved to walk through the Cordillera Cantabrica for another two weeks. I suppose I could have just turned around and walked back to Oviedo. Perhaps that is an idea for another day. Once again the weather was perfect, the numbers of fellow pilgrims was light, the terrain was challenging enough to make it interesting, and the scenery was some of the best we encountered. I highly recommend walking this route whatever your motivation might be. We had no problems finding accommodation in either albergues or in other private settings. The big challenge that gets a lot of press is the stage from Campiello to Berducedo. This is the stage where you have to decide (again) whether to walk either an upper route (Hospitales) or a lower route (via Pola de Allende). Again, much talk centers on the climbs up to, and along the upper route. Yes, there are some steep pitches (where you definitely will be short stepping), but not that many. Much of the climb is moderate (you are not short stepping, but that does not mean easy). However, a slow and steady pace will win the day, and the scenery is spectacular. If the weather allows a good view don’t hesitate to take the Hospitales route. A second stage (the next day) that drops you down to the reservoir at Grandas also gets a lot of press for the long descent. I did not find this to be much of a problem. Robin’s previous leg problem reawakened during this decent, but she managed surprisingly well once we descended at a slower pace. The only sizable city you pass through, after Oviedo, is Lugo, and that suits me fine. I prefer to be out in the country rather than trudging through cities, and their suburbs. 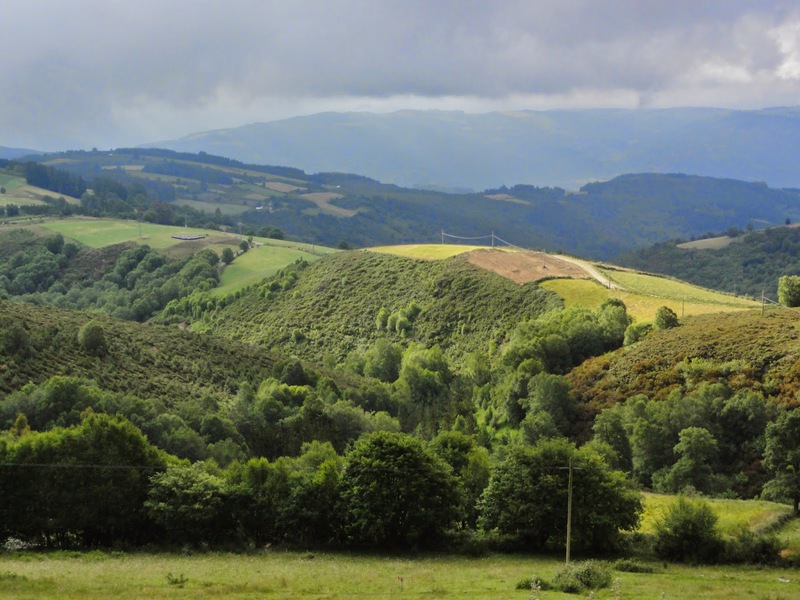 The camino after Lugo, and all the way to Melide, is quiet and pleasant. It is a mix of roads and paths, and is a wonderful walk. At Melide you join the Camino Frances, and all that changes. There you become part of the flowing stream of folks all trying to get to Santiago now only 2-3 days away (depending on your pace). As you might expect, after covering the distance we had already covered, these last 2-3 days were not going to be a problem, and they weren’t. It was actually kind of fun to see the Camino Frances at this time of year as our two previous trips down the Frances had both been in the depth of winter. So, that was our pilgrimage. It was a journey filled with all the challenges, joys, disappointments, and surprises that make life interesting. I am not sure whether I am ready for another 1000 miler, but I feel confident enough to say the Camino is not done with us, nor are we with it. I’ll post something about our equipment shortly. Hi Karen, thanks for always being part of our journeys. Hope you and Dayton have fun whenever you find yourselves walking the Primitivo, and I'll enjoy reading about it.